A big hello to all my new fans and a huge thanks to everyone who's helped push my page. 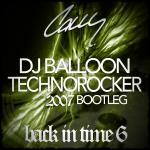 As promised here are 18 of my unreleased bootlegs and edits, as played in our Cally & Juice sets over the years. Every one has been remastered so they're all sounding better than ever, plus they each have their own artwork. Thanks for your continuing support! !